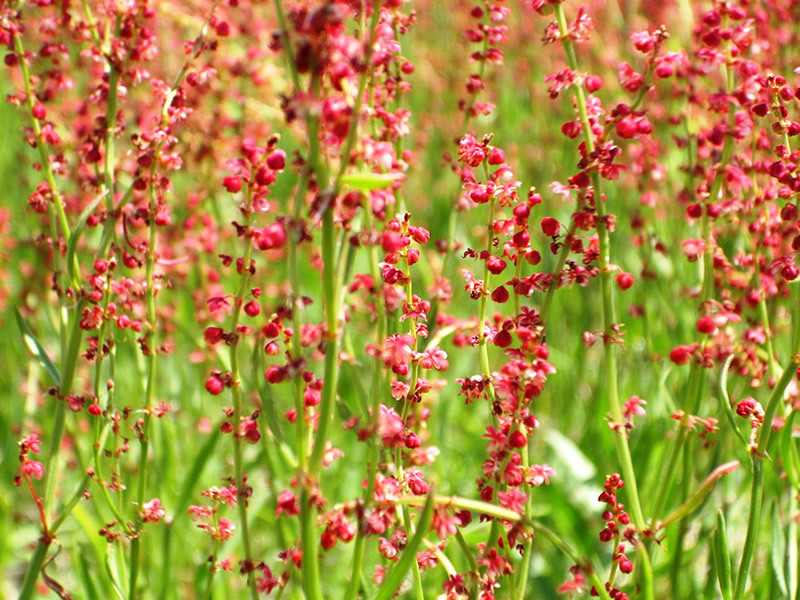 Sheep sorrel (Rumex acetosella) is a tall herb that is found in grasslands, prairies, meadows, fields, pastures, and roadsides of Europe, Asia, and North America. This perennial plant from the buckwheat (Polygonaceae) family was originally from Eurasia, but is now naturalized throughout Canada and the United States. Sheep sorrel is also known as field sorrel, red top sorrel, sour grass, common sorrel, and dog-eared sorrel. 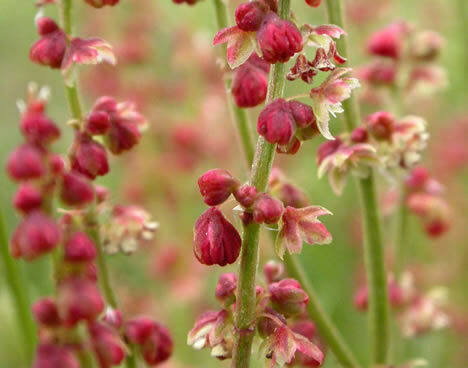 The plant is related to other highly acidic members of the Rumex genus, including French or garden sorrel (Rumex acetosa). Sheep sorrel is considered a common weed in the United States. Its slim reddish stems grow to a height of 4-24 in (10-60 cm). Narrow arrow-shaped leaves that have a pungent lemon scent grow to 1-4 in (2-10 cm) long. The slender roots grow to a depth of 5 feet (1.5 m). Near the upper part of the stem are small yellow or red flowers that bloom in the spring and summer, generally from April to September. The male plant has yellow flowers while the female plant has red flowers. Sheep sorrel has antioxidant, diuretic, detoxifying, laxative, astringent, and diaphoretic properties. The herb is a rich source of vitamins and minerals. Vitamins B complex, C, D, E, K, and P are included in sheep sorrel. It contains sodium, calcium, sulfur, iron, magnesium, chlorine, silicon, copper, iodine, manganese, zinc, and beta carotene. The silicon in sheep sorrel may help the nervous system. Other constituents of sheep sorrel are malic, oxalic, tannic, and tartaric acids; chlorophyll; rutins; polysaccharides; protein; and carotenoids. The oxalic acid in sheep sorrel is the substance that gives the leaves a sour lemony taste. Large intakes of sheep sorrel can be poisonous due to the oxalic acid content. 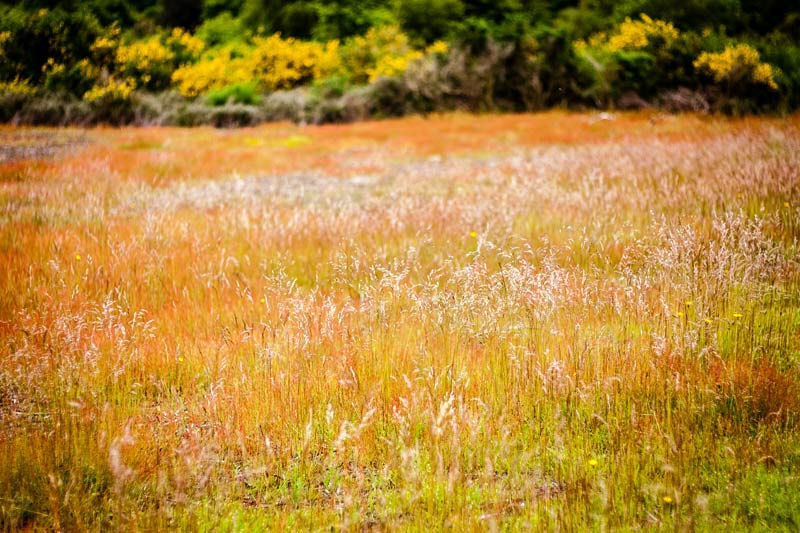 Livestock that have eaten excessive quantities of sheep sorrel have been poisoned. It has also been reported that large consumption of sheep sorrel causes dermatitis in some animals. Too much oxalic acid can prevent the body from using important nutrients, especially calcium. When the plant is cooked, the oxalic acid content is reduced. French sorrel has been used as a food for hundreds of years. Native Americans ate the leaves, stems, seeds, and roots, and seasoned their meats and bread with the herb. The Irish used French sorrel as an ingredient in soup, and the French added the leaves to salads. In colonial times, sugar and vinegar were added to French sorrel leaves to create a sauce that was eaten over cold meat. A dark green, brown, or dark gray dye was made from the roots. Medicinally, sheep sorrel was used as a folk remedy to treat cancer. Today, French sorrel is still used as a food. The leaves are used as a thickener in soups, ground into a powder and made into noodles, or added to salads. Sheep sorrel is gaining popularity as an anticancer agent and for its ability to break down and reduce tumors. A poultice made from sheep sorrel is reported to have a drawing effect on tumors or cysts. Sheep sorrel’s rutins and polysaccharides act to prevent tumors and other cancerous growths. The beta carotene contained in sheep sorrel acts as an antioxidant, increasing the production of white blood cells and T-cells (cancer-killing cells). The chlorophyll in sheep sorrel acts to purify the liver, promote regeneration of tissue, decrease swelling of the pancreas, strengthen cell walls, cleanse the blood, and may increase resistance to x rays. The oxalic acid also has antitumor and anticancer properties. Sheep sorrel is an ingredient in essiac tea, an herbal preparation that was adopted from an Ojibwa recipe and is used to treat a variety of cancers. The tea also contains rhubarb, burdock root, and slippery elm. Sheep sorrel has also been used to treat the side effects of chemotherapy. Herbalists recommend sheep sorrel for treating mouth and throat ulcers, digestive disorders, hemorrhoids, loss of appetite, fevers, scurvy, and infections. The juice extracted from the fresh plant is used to treat urinary and kidney disease. Sheep sorrel can be applied externally as a topical wash for skin problems such as herpes, eczema, and itchy rashes including poison ivy and hives. All parts of sheep sorrel (leaves, flowers, roots, and stems) are used medicinally. The leaves and stems should be harvested in the spring or summer before the flowers form. The roots are harvested in the fall. Small quantities of the leaves of sheep sorrel may be eaten in salads or boiled as a green vegetable. Sheep sorrel is also available in tincture, capsule, or tea form. For the tincture, 30-120 drops may be diluted in a glass of water and drunk daily. The leaves are brewed as a tea to treat fever, inflammation, and scurvy. A tea made from the roots is used for diarrhea and excessive menstrual bleeding. To create an infusion, the leaves and stems are steeped in hot water for five minutes, or the roots are steeped 10 minutes, and 2-3 cups can be drunk daily. 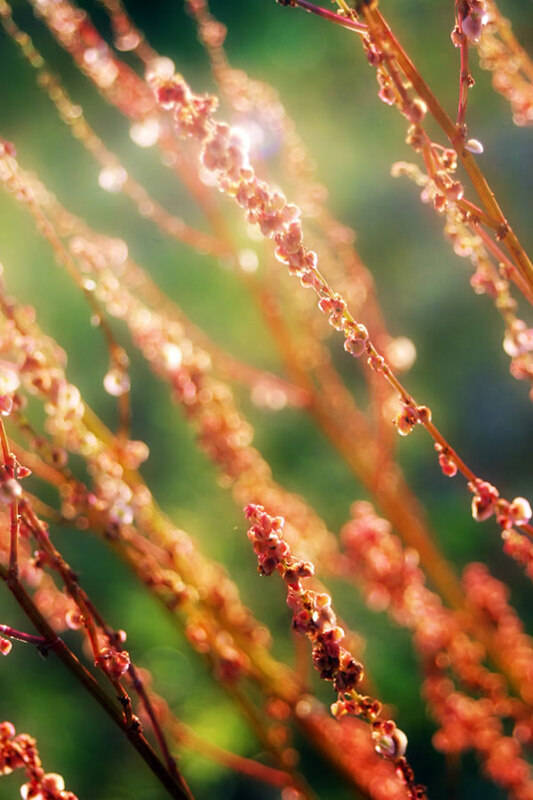 Due to the high oxalic acid content, large doses of sheep sorrel can be toxic. Oxalic acid can cause kidney stones, irritate the kidneys, or worsen an existing kidney disorder. For these reasons, those with kidney problems or who are prone to kidney ailments should not use sheep sorrel. When using the leaves as a food, one should eat small quantities, or cook them to reduce the oxalic content. Sheep sorrel under the evening sunlight, kind of cool isn't it? People with arthritis, rheumatism, endometriosis, gout, or kidney stones should use caution when taking sheep sorrel since it may aggravate their condition. Sheep sorrel should not be used by children, infants, or pregnant or breast-feeding women. High doses of sheep sorrel may cause nausea, a tingling sensation of the tongue, or a severe headache. There are no known interactions between sheep sorrel and standard prescription medications as of 2004.